Your skin is a barrier between you and the environment, protecting you from heat, light, injury and infection. Breach that barrier with a tattoo needle, and — although it's not common — you may wind up with problems. Tattooing has been around for thousands of years. These days, 21 percent of adults in the US report having at least one piece of permanent artwork on their bodies, according to the Centers for Disease Control and Prevention (CDC). But tattoos are not without their risks. These risks may include infections, scarring, rashes and allergies, as well as reactions during the medical test known as magnetic resonance imaging (MRI). MRI reactions are very rare, however. Even temporary tattoos — which do not involve using a needle — can cause skin reactions. In a traditional tattoo, a needle deposits colored ink into the skin. These designs may include a variety of ink colors, including black and white ink. In a permanent makeup tattoo, a needle deposits colored ink into the skin to mimic eyeliner, lip liner, eyebrow pencil or other cosmetics. In a henna tattoo, plant dye (henna or mehndi) is stained onto the skin. And in a temporary tattoo, a design on paper is stamped onto the skin with water. Henna tattoos may last up to three to four weeks, while temporary tattoos may last hours to days. Coyle S. Connolly, DO, a clinical and cosmetic dermatologist and president of Connolly Dermatology, told dailyRx News that patients should be proactive in protecting themselves. "[Gather] as much information about the tattooing process [as possible] before the actual procedure," Dr. Connolly said. "A simple, direct discussion with the tattoo artist regarding sterile technique and complications they have personally encountered is advised. 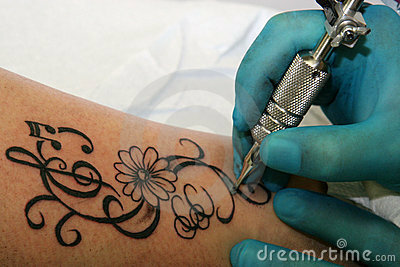 Voice your concerns with the tattoo artist and establish a comfort level with their explanations." Tattoo reactions are relatively uncommon. One study of 300 people in New York City found that 6 percent reported some type of skin reaction to a tattoo. Infection is the most serious risk from tattooing, according to the US Food and Drug Administration (FDA). Dirty needles can pass infections, like hepatitis and HIV, from one person to another. However, it's very rare to contract one of these diseases in most tattoo parlors today. Hepatitis is a viral infection that can permanently damage the liver, while human immunodeficiency virus (HIV) is a viral infection that can lead to acquired immunodeficiency syndrome (AIDS). AIDS is a disease which may lead to the progressive failure of the body's immune system and allow life-threatening infections and cancers to thrive. If the skin is not carefully cleaned or if the tattoo artist doesn’t wear gloves, other viruses and bacteria can be spread and cause infection. Inks contaminated with bacteria may be another source of infection. Inks are not always manufactured under sterile conditions, and tattoo artists may not always keep these inks sterile when using them. If the tattoo artist doesn’t use sterile water to mix the ink, the water may also carry bacteria. However, most professional tattoo artists follow safety precautions to protect their customers. They sterilize equipment, wear gloves and use new sterile needles for each tattoo. The skin can have a negative reaction to anything that is applied to it, including tattoo ink and temporary tattoo ink found on stickers or papers. Ink from henna — a hair dye that has never been approved for use in tattoos by the FDA — can also cause skin reactions. According to the FDA, among the potential problems are redness, blisters and weeping wounds. The skin may also develop an increased sensitivity to sunlight, lose pigment or even be permanently scarred. According to the FDA, allergic reactions to various ink pigments in both permanent and temporary tattoos are another possible complication. Granulomas — small knots or bumps which may form around material that the body perceives as foreign — can also develop if the body rejects the particles of tattoo pigment. No official research has been performed on the safety of tattoo ink, according to the FDA. It is not known how or if tattoo ink breaks down in the body, whether it is safe or how the body tends to respond to the ink. Tattoo ink may also migrate to other parts of the body, such as the lymph nodes, according to the FDA. It is not known whether having this ink in the body poses a health problem. The good news is that most reputable tattoo artists follow safety procedures, according to the FDA. The artist should wear gloves while tattooing, the equipment should be sterilized between customers and the artist should open a sterile needle in front of the customer. Inks and ointment also should be portioned out for individual use. In addition to these precautions, the American Academy of Dermatology (AAD) has some recommendations. Don’t get a tattoo in an area where there is a mole. This can make it too hard to see if the mole shows any signs of skin cancer in the future. Also don't get a tattoo during pregnancy. It is not known how tattoo ink may affect an unborn baby. Ultraviolet light from the sun can fade tattoo inks. The AAD recommends applying a sunscreen before heading outdoors. This sunscreen should have a sun protection factor (SPF) of 30 or higher. Apply it at least 20 minutes before heading outside. Use SPF lip balms to protect permanent lip liner from fading, and wear a hat to protect permanent eyeliner. The AAD also notes that tanning beds can affect tattoos. Tanning beds may cause sunburn-like reaction, making the tattoo painful and red. Use water-based lotions or other products on the tattooed area. Petroleum-based products can also fade the ink. If you have any kind of skin reaction or your tattoo changes in any way, see a dermatologist. "Possible problematic signs include increased redness, pain, fever, scarring, sun sensitivity, itch and assorted rashes," Dr. Connolly said. "[It's] best to follow your instincts. If the area just doesn't look or feel right then it is best to seek immediate medical attention."